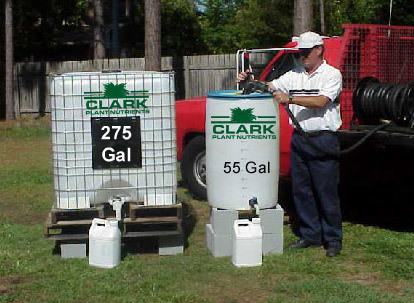 Clark Plant Nutrients, Inc. started in 1990 primarily with bulk blending and custom spreading of granular fertilizers with a minor emphasis on liquid foliar fertilizers. By 1996 the business evolved into liquid fertilizers only. After several years of trial and error with some courageous superintendents to experiment with our different formulations, we have developed an array of products that will meet any need by golf courses, lawn care companies, or athletic complexes. We will provide to all our customers a quality product, sound agronomic advice, friendly service, and timely delivery. We will constantly strive to make your company look good.